Are you an Invisalign wearer? Here are some simple and easy dental hygiene tips to keep your teeth and gums healthy during your treatment. Despite their many benefits, traditional metal braces have significant drawbacks including their glaring presence, mouth sores, and discomfort. The good news? Advancements in dentistry have created alternatives, including Invisalign, which offer a more comfortable method of straightening your teeth. At Dr. Korol Dental Clinic, our team of dentists and dental hygienists offer quality and holistic dental services from teeth cleanings and safe mercury removals to Invisalign and sedation dentistry to meet all your oral healthcare needs. Invisalign can help you achieve a beautiful, straight smile in just a few months but during this time, it’s important to follow a strict dental hygiene routine to ensure your teeth and gums remain healthy. In fact, the most significant step you can take during your Invisalign treatment is taking good care of your aligner trays and your teeth. Your daily dental hygiene routine while wearing Invisalign braces is no different than your normal oral care regimen. One of the biggest benefits of Invisalign is that they are removable aligners. Not only does this make eating your favourite foods easier, but it also makes cleaning your mouth and maintaining your oral health more simple. 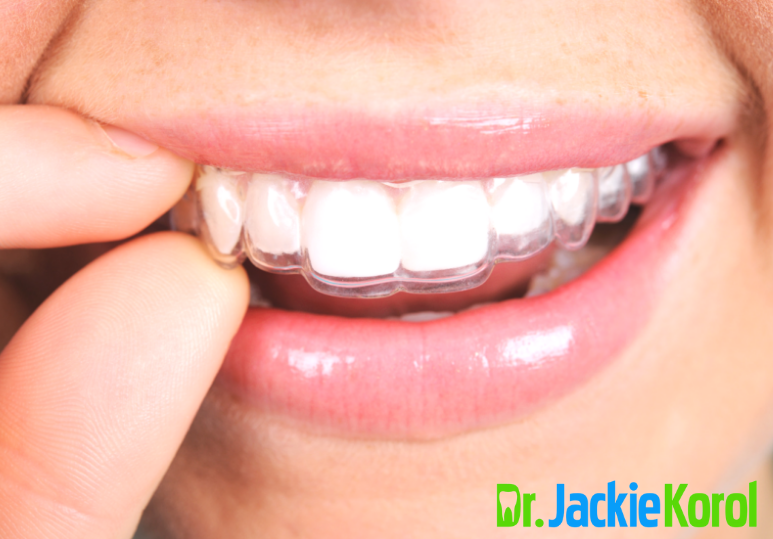 A great advantage of Invisalign is that they come with invisible aligners. However, if you fail to look after them, these trays can become stained and visible. They could also harbour bacteria, compromising your treatment and oral health. Brush your trays with a soft-bristled toothbrush twice a day. Wash your hands with soap and running water every time you have to touch your aligners. DO NOT use hot water when washing your trays as this may warp them, Always use lukewarm water when cleaning your aligners. Rinse your trays after every meal to avoid the buildup of bacteria. If you choose to use a cleaning solution, ensure that it doesn’t have any colours or harsh ingredients as these could damage or stain your trays. Tip: The best thing you can do is to check with your orthodontist or dentist for their cleaning recommendations to ensure your teeth and gums stay healthy during your treatment. When you remove your aligners to eat or go to sleep, make sure to carefully store them in their case. If you don’t have one, you can use a glass of water instead. A great tip is to store your aligners is diluted antimicrobial mouth rinse as you eat to reduce plaque buildup and improve your breath. Wearing damaged or broken Invisalign aligners can have a negative impact on your treatment plan so if your tray is warped, switch to your previous set of aligners and visit your dentist immediately. To find out more about our customized Invisalign treatment plans, or to get more advice on how to take care of your aligners, contact our Calgary holistic dental clinic today at 403-245-9099 or book an appointment.